For our Niagara Wine Week we start with our visit to Coyote’s Run Estate Winery a small winery that sits just below St. David’s bench in St. David’s, Ontario. This vineyard has started to make a name for itself in the past few years with their Pinot Noir offerings from both their principle vineyards, Red Paw and Black Paw. While it would have been easy to go for one of these better known wines, we choose to allow Brian Yeo, the winery’s Hospitality Manager, direct us to something different and in this case, quite unique. 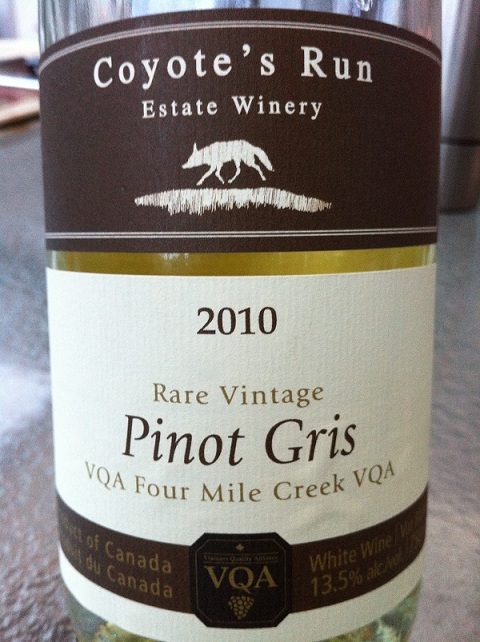 The 2010 “Rare Vintage” Pinot Gris does not come from either of Coyote’s main vineyards but in fact comes from Four Mile Creek. It is also not considered a small lot as this is a one-off wine. I get the feeling that the winemaker (David Sheppard) will make one-off wines based on the challenge or superstar amongst the year’s growth on an ongoing basis, and this wine is one of those. I appreciate Brian taking the time to point us in this direction as Pinot Gris is simply not on our regular drinking list. This wine was barrel fermented in old Hungarian oak and it was an interesting ‘drink’, so let’s move on to the review. A pale yellow, almost honey colour awaits you as it is poured. Immediately you will get a hint of vanilla and we had slight flowery undertone as you pass this under your nose. A few more sniffs start to bring the fruit to the table. After a good slurp, immediately you get a nice level of acidity and a wine that is smooth, almost luxurious. The apricot, pear and spices (nutmeg) all start to fill your senses as you work on your glass. Compared to most Pinot Gris’ you will find this much more challenging and exciting. It is not a simple wine that needs to be chilled and drank on the veranda and you could easily slip this to your favorite Chablis fan and have them work at determining it’s origins. A fun and enjoyable wine it will serve you well to head to Coyote’s Run to pick up this bottle. At $24.95 it is worth the extra few dollars and you will not be disappointed with the craftsmanship. The CWG subjective rating is 87 out of 100. This entry was posted in Canadian, Wine and tagged coyote's run, niagara, pinot gris, wine review. Bookmark the permalink.